My name is Lenka Argalasova, I am in the last year of Masters in painting conservation at the Condé school in Paris. I have chosen to do my internship at the conservation studio of Marjan de Visser, because I wanted to discover the “Dutch way” in painting restoration. I also chose to do an internship in the Netherlands because I always admired Dutch art, especially 17th’s century paintings, But I like restoring old art as well as contemporary art, because I find that restoring a contemporary painting is sometimes more challenging than an old one. Marjan de Visser shows Josee Thissen the options of retouching. Marjan en Josee always have fun working together. 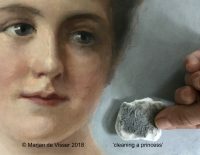 Painting restorer Marjan de Visser and Art historian Joseé Thissen-Rojer discuss the possibilities of retouching the oil paint of an easel painting by Curaçao artist Lucila Engels. Lucila made this painting in the Seventies of the Twentieth century; it depicts a ‘harbor scene’. The Insurance Company ENNIA bought it soon after it was finished. This is not the first collaboration between Marjan en Josee. Joseé brought Marjan to Curacao in 2005 to investigate the painting collection of ‘Landhuis Bloemhof’. Three year later they started the conservation with the financial help of UNESCO. Together they hold a lecture about the conservation process. Curacao @ Art Foundation is the latest project in which these two women collaborate. Initiated in 2011 by Joseé Thissen-Rojer for which she obtained a grant from the ‘ Prins Bernhard Cultuurfonds Caribisch Gebied’, presented by the Governor Mister Goedgedrag. This foundation advocates worldwide attention for the Visual Art of Curacao. Josee Thissen Rojer receiving the grant from Govenor Frits Goedgedrag. 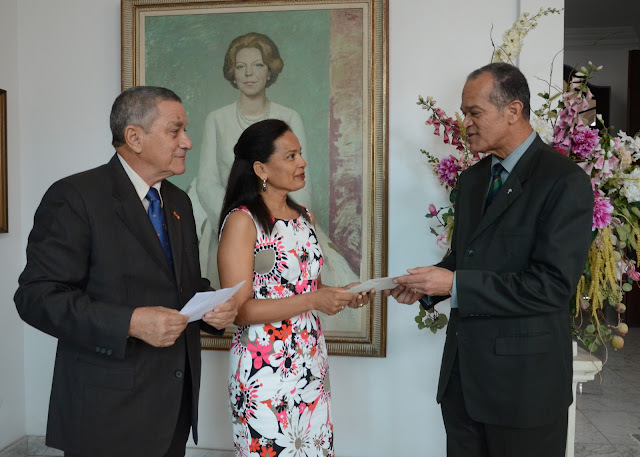 Left, President of Prins Bernhardfonds: Mr. W. Curiel.